This is the first Assembly election for Telangana after the State was created by bifurcating Andhra Pradesh. The Telangana Assembly elections 2018 will be held on December 07, 2018 in a single-phase and the results will be declared on December 11 along with that of Mizoram, Madhya Pradesh, Chhattisgarh, and Rajasthan assembly results. Check out the below article to get the complete information regarding Telangana Assembly Elections 2018 Results Live Updates and Winners List PDF Constituency wise, Party wise. In Telangana, over 2.8 crore voters, 1.41 crore men and 1.39 crore women including 7.04 lakh voters under the age of 20, will exercise their franchise in 32,815 polling stations. 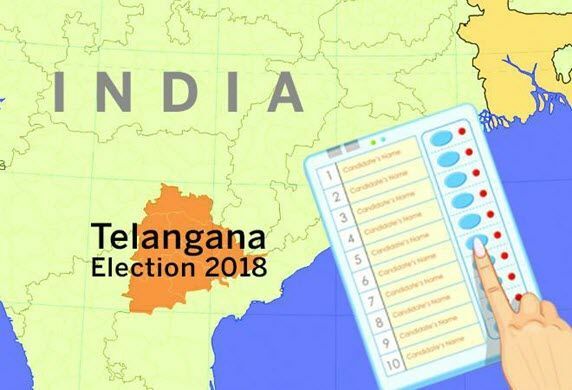 Major political parties contesting the election in Telangana state are Telangana Rashtra Samiti (TRS), Telugu Desam Party (TDP), Congress, Telangana Jana Samithi, Communist Party of India, All India Majlis-e-Ittehadul Muslimeen (AIMIM) and BJP. Four opposition parties in the state, the INC, the TJS, the TDP, and the CPI have announced the formation of a ‘MahaKootami’ (Grand Alliance), with an objective of defeating the ruling TRS in the elections. In 2014 assembly election, TRS won 63 seats. Congress stood second with 21 seats, AIMIM secured seven while the BJP won five and its then alliance partner TDP won 15 seats. The five remaining seats went to Others. Constituency wise winners list of Telangana Vidhan Sabha Elections 2018 will be updated on this page. So, stay tuned to this page. Hope you like this, Telangana Assembly Elections 2018 Counting, Results Live Updates, Live Streaming, Schedule, Party Wise, Candidates Wise, Seat Wise, Constituency Wise Winners List article. If you like this, then please share it to your friends.